If you allow your dog to get up on the furniture, you can end up with saliva stains. This guide is about cleaning dog drool from microfiber. 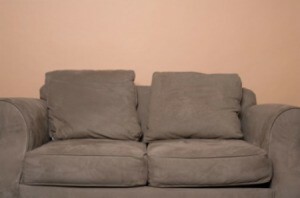 I have a microsuede couch that looks horrible, I have three dogs who drool A LOT! Please help tell me how to clean the stains. I have one too but I bought a couch throw that I wash every week. Once you get it clean you might want to buy something to cover it. I use baby wipes! They work well and I have heard it's because of the alcohol in baby wipes and of course the moisture. The secret to a microsuede couch is not to get it too wet or it leaves spots or rings. I have already read on the net just pure rubbing alcohol will get spots out yet I have not tried that. I have just looked this up and they recommend spraying it with rubbing alcohol and dabbing it dry. I haven't tried it yet, but will shortly. I have four dogs. I have slobber from them on my microfiber couch. How do I remove it? I would try Windex it has done awesome for us for our micro fiber couch. My dog loves to take his chew toys onto my microfiber couch. Unfortunately, his saliva makes the couch wet and it seems like it has matted down the microfiber. Now I have whitish stains on my chocolate brown couch, and the fiber is matted down. A friend of mine washes her microfiber cushion covers in the washing machine. That just seems like it would mat down the fibers even more. Does anyone have thoughts or suggestions on this? How can I get a dog drool stain off my microfiber love seat? Is bringing the cushion covers to a dry cleaners a good idea? Can they get it out or will it hurt the fabric?